If you have any information about these crimes or any person(s) involved, you are urged to call Crime Stoppers at 255-1111 or submit a Web Tip . You do not have to give your name. CRIME STOPPERS will pay a cash reward of up to $2000 and you can remain anonymous. 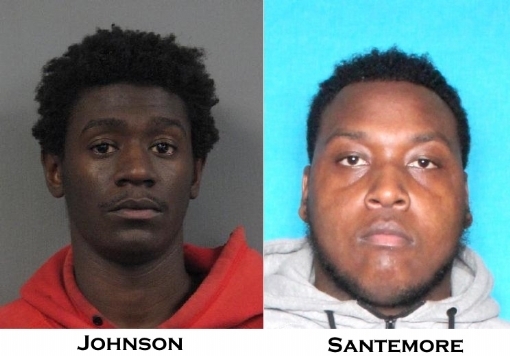 As a result of the continuing investigation into this incident, detectives with the Ruston Police Department applied for and were granted arrest warrants charging Stacy Vincent Santemore, Jr. and Alfred F. Johnson with Attempted Second Degree Murder. These subjects are originally from the New Orleans and Gretna areas, but have ties to the Rustion and Grambling (GSU) areas. Both should be considered armed and dangerous and should not be approached. If anyone knows the whereabouts of Stacy Vincent Santemore, Jr. or Alfred F. Johnson, they are asked to call the Ruston Police Department at 318-255-4141, their local law enforcement agency, or dial 911. On August 17, 2017 Officers from the Ruston Police Department responded to the Dark Street area in Ruston regarding a shooting. Upon arrival officer located one victim who was suffering gunshot wounds to the head and abdomen. The victim was transported to the Norther Louisiana Medical Center Emergency Room and later transferred to a Shreveport area hospital where he was to undergo surgery. The investigation into this crime is ongoing by the Ruston Police Department Criminal Investigative Division. The Ruston Police Department needs your help identifying this subject. On July 13th at approximately 3PM he picked up an iPhone from the counter at Newk`s Eatery at 301 South Vienna; Ruston. This subject was described as a black male approximately 50-55 years old, dark skinned, with some grey hair and light facial hair. He is approximately 5`7" and weighs about 170-180 pounds. During the months of March, April and May 2017, multiple nighttime vehicle burglaries have been committed in several neighborhoods and subdivisions in Lincoln Parish. The suspect(s) have entered numerous unlocked vehicles and have stolen property from within many of these vehicles, including firearms, currency and other personal items. The remains of multiple dogs were discovered today by construction workers while working on a drainage project off Moore`s Dairy Road in south Lincoln Parish. The skeletal remains were discovered when a nearby beaver pond was drained. The preliminary investigation leads law enforcement to believe the dogs are victims of illegal dog fighting. Dogfighting is a felony crime in Louisiana. If you have information about the demise of these animals or any information relative to dogfighting please submit a tip.